A police officer in Columbus, Ohio, instructed an 11-year-old caught Saturday with a BB gun to remember one name: Tyre King. The 13-year-old King was killed in 2016 when another police officer responding to reports of an armed robbery saw him pull what appeared to be a gun from his waistband. By the time officers determined the object was a BB gun, it was too late. When Officer Peter Casuccio stepped out of his patrol car to confront an 11-year-old on Saturday, his own weapon was drawn. Like King, the youngster pulled the gun from his waistband before dropping it onto the sidewalk. Casuccio said he knew it was a BB gun only when it broke into pieces on impact. "You could've been gone," Casuccio told the youngster in front of his family members. "Everything you wanted to do in this life could've been over in less than three seconds." Casuccio was patrolling the neighborhood when he heard a report of two young black males flashing a gun. Body camera video shows Casuccio telling the youths, ages 11 and 13, "this is getting kids killed all over the country." Though the youngsters quickly apologized, Casuccio refused to let them walk away. He said that he didn't want to scare them, but that they needed to understand the gravity of their actions. "If you get the opportunity to make an impact on a young person, that's the best way to prevent future crime," Casuccio said Wednesday. It's easier, he added, to get the message through to a youth than a young man. Casuccio drove the 11-year-old to his home after his friend was picked up by a parent. As soon as the youngster stepped onto his lawn, his mother yelled. "He could've shot you, because that looks real to me!" she said of the gun. She later thanked Casuccio for not pulling the trigger. "I started crying myself because I could have lost my child," Tielissa Sowell told WSYX-TV. 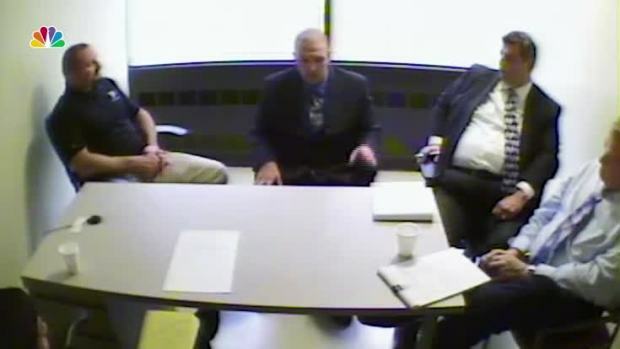 Footage released nearly two and a half years after the fatal shooting of Tamir Rice, 12, show the reactions of the Cleveland police officers involved in the incident. Timothy Loehmann, the rookie officer who shot Rice, remained stoic throughout the interview. His partner, Frank Garmback, got emotional as he walked through the incident with internal investigators. "I didn't know it was a kid," Garmback said in the interview. Before he left, Casuccio recounted King's shooting and asked the youngster to reflect on how close he came to death. "That's not the way it worked out today," he said, "but it could've."